If you were watching The History Channel last night or very early this morning, you may have seen a bit of Council Bluffs. The latest episode in the " Extreme Trains" series focused on the Transcontinental Railroad and Union Pacific Railroad spokesman Mark Davis says a crew for the show started filming in Council Bluffs last February. "Began taping in our yard in Council Bluffs. The crew spent some time in the U.P. Museum (and the) Harriman Dispatch Center," Davis says. "And then from there we started working our way across the state, ended up in North Platte, spent the day there and ended up all told — after day eight — in Sacramento, California." The Transcontinental Railroad started in Council Bluffs and ended in Alameda, California. It was completed in 1869. By linking the rail lines that already existed in the eastern United States through Council Bluffs and to the west, the line allowed passengers — for the very first time — to travel from the Atlantic coast to the Pacific coast by rail. Davis saw last night’s The History Channel program. "It shows not only the Omaha/Council Bluffs area, the historic references — not only the Union Pacific Railroad, but how the railroad was built — as well as what happens today," Davis says. "It’s a good, well-rounded show." Matt Bown, the host of the "Extreme Trains" series, rode part of the route from Council Bluffs to California. "Probably the coolest train ride I have gone through in my railroad career," Bown says. "…It blew my mind." 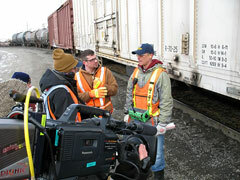 The "Extreme Trains" episodes air at 9 p.m. on Tuesdays and the "Transcontinental Railroad" episode will be rebroadcast sometime next year.